Do you prefer Van Hagar debut or Montrose debut? 5150 is my desert island album so I’ve gotta go with that. Montrose is great though. Way better production by Ted Templeman on Montrose than 5150’s dated production. My two favorite albums on which Sammy is the vocalist. 5150 by a very thin hair. 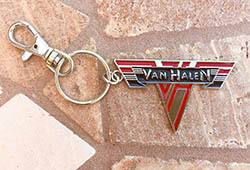 You said Van Hagar, you lose. You said Sam Halen, you lose. Most Sam fans don't even know Montrose. You'd been better off with a Sam solo record. Frajitas, Ten 13...or something. First Montrose record is good. But I like VH a lot better than Montrose. The Montrose debut is one of the best rock albums of the 70s, but 5150 was and is still magical. Sammy and Eddie were better together than Sammy and Ronnie, and that is no disrespect to Ronnie. It's 5150 time. Squalen, I appreciate your admiration for Chickenfoot. Their debut was killer and their lives shows were fantastic. For me, it is 5150, Montrose, and Chickenfoot. i really like Montrose's first album better than any of Sammy's solo albums. i like 5150 better than Montrose or Sam's solo efforts. Montrose was great, but even Ed and Al at a lower level of intensity is still enough for the win. But, yeah, it is a little bit of a comedown to go from the blazing heavy, and dark vibe of GGB and HOP to close the last album then start up again with the extremely dated programming Al decided to go with on the Simmons pads on 5150 coupled with the drastic change in Ed's guitar tone. The production didnt help. Ted's production on Montrose, and the six pack, was vastly superior. He wouldve greatly helped 5150 in that regard.